B Co., 112th Infantry Regiment, 28th Division. KIA November 2, 1944. 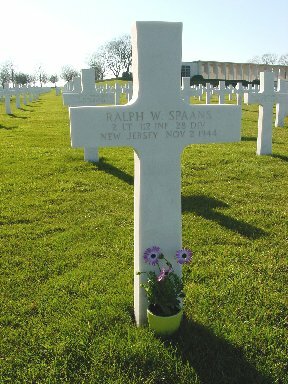 1st Lt Ralph Spaans was platoon leader of the 1st platoon, B Company on November 2,1944. Colonel Clifford Hackard, then Captain Hackard commander B Company, was with Lieutenant Spaans at the start of the attack and lost contact with him about 1pm. He found his body at 6.30pm, that same day. A measure of the chaos that must have existed is that though his company commander found him the day he was killed November 2 1944 he was posted missing until declared dead March 19 1945. The following account is from the book Follow me and Die, by Cecil Currey. Unfortunately the name was spelled wrong in the After combat reports, hence in the book. The after combat reports have since been amended. "Soldiers of Company B walked carefully forward, alert for any sign of trouble. Just as the battalions advanced in a column of companies, so Baker Company advanced in a column of platoons-1st 3rd and 2nd. The weapons platoon brought up the rear. Suddenly the air around 1st platoon was shattered by fire from German Mausers, Spandaus and machine guns. 1st Lt Ralph Spaans, 1st platoon leader, walked point for his men. German machine gun fire raked him from legs to head. He was dead as he hit the ground. His body lay in the path of enemy fire and was hit repeatedly thereafter. The advance collapsed as soldiers of the 1st platoon frantically sought cover." Trying to keep his men moving Captain Hackard brought up third platoon hoping their combined strength would force hidden Germans to retreat. The third platoon leader was also hit and with a broken leg dragged himself to a hole and directed fire with an SRC536 radio. He was not evacuated until after dark. He too later lost his life. Lieutenant Spaans was born in Medford, Massachusetts. He Graduated from Bogota High School, Bogota, New Jersey and joined the army in New Jersey September 24, 1942. He entered infantry school at Fort Benning, Georgia, February 16, 1943, and graduated 2nd Lieutenant May 8, 1943. He embarked Southampton, England July 17, 1944 for Utah Beach. He was attached to the 1st Army July 23, 1944. He fought through every battle through France, Belgium and into Germany where he was killed in the Huertgen Forest shortly after midday November 2, 1944. He is buried at the Henri Chapelle American Cemetery and Memorial in Belgium.